ABOVE: The Peace & Love Hostel may be groovy (and we'll bet the brownies are fantastic), but it's a long way from most sights and attractions. Paris is divided into 20 arrondissements, or districts. From a tourist's point of view, the most desirable districts are those near the major sights, museums, and attractions. A hotel in the outer reaches of the 12th, 17th, or 20th might offer cheaper rooms than a more centrally-located hostelry, but you'll pay for your savings by spending more on Métro, RER, or bus tickets. The 7th arrondissement is popular with American tourists, who are drawn by the Eiffel Tower and a clutch of hotels that cater to U.S. travelers and tour groups. However, for overseas visitors arriving from Charles de Gaulle Airport, the 7th is harder to reach by public transportation than the 9th (Roissybus) or areas of the 1st, 2nd, 3rd, 4th, 5th, and 6th that are within walking distance of the RER "B" Line's Châtelet-Les Halles and St-Michel stations. Montmartre (18th arrondissement) and the area of the 10th around the Gare du Nord are a Métro ride or a long walk from the Seine, but they're extremely convenient for rail travelers who arrive on Eurostar or Thalys. If you're a British, Belgian, or Dutch tourist who's coming to Paris for the weekend, you may prefer to book a room within walking distance of the Gare du Nord (read our Montmartre hotels article) and rely on public transportation to reach the sights. 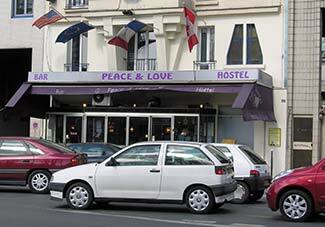 For help in choosing a hotel location, see "Where to Stay in Paris" and our Paris transportation articles. 1st inset photo copyright © José Quevado Flé.